This Howto was Google Translated from Brazilian to English. “Suppose you bought an iMac that will stay in the office connected to cable broadband. All you need wireless access to the house over a notebook and a smartphone. Normally what would you do if you had to share this connection through the house? Buy a Wi-Fi router, right?Wrong. After spending all his savings on a Mac, you can think about saving. With cable connected to your Mac, open System Preferences and go to Sharing. You’ll find a list of services on the left that can be shared, one of which is the Compart.Internet. Go to him, without checking the checkbox that is located beside the name. If already checked, just to be able to disable modify the settings. On the right you probably already have the correct options to start sharing. 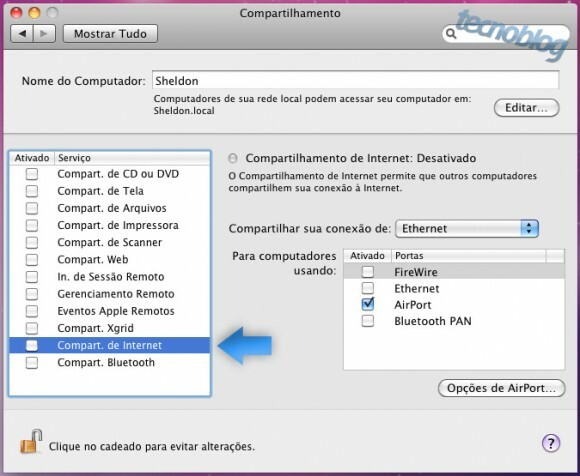 Make sure that the list Share your connection from theEthernet option is chosen. Farther down the list displayed by using computers to enable theAirPort. Ideally, you set a password to protect your wireless network. 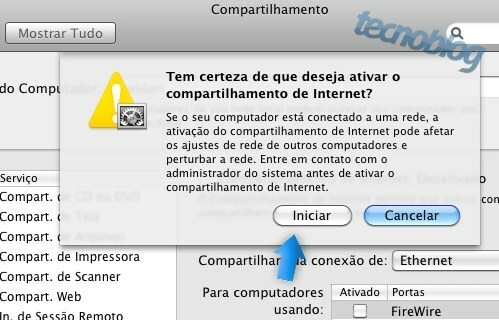 If you are sharing files or do not want someone snooping around your network, this step is required. On second thought, leave an open wireless network is never a good idea. Click the AirPort Options …, name your network (by that name is that your network will be found) and enable the Enable encryption (using WEP). Note that the password length will vary depending on the type of Extended WEP key you choose. Unfortunately, WEP is not the best, so choose to use 128-bit and enter a password, which must have 13 digits. Try using a password with digits harder to guess someone as special characters in place of some etra ¬ $. Finally activate the checkbox list on the left of the Compart. Internet. Do not be alarmed by the warning that is displayed, click and enjoy. 2. Open the script with your favorite text editor. Change “1680×1050”, and or 1680×1050, and or 1680×1050 60 (60 been the frame rate, give extra attention to that! It’s very important that you type the correct frame rate for your external monitor!) by the resolution you want to output on your external monitor. Save and exit. For more info in case you don’t know how to install it, see here.